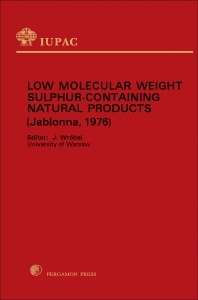 Low Molecular Weight Sulphur Containing Natural Products contains plenary lectures presented at the International Symposium on Low Molecular Weight Sulphur Containing Natural Products held at Jablonna, Warsaw on July 12-16, 1976. This book contains six papers separated as chapters. Topics include low molecular weight sulfur-containing compounds in nature; oxidation of some biologically active and related sulfur containing compounds; and the α-mercapto-α-amino acids and dehydro amino acids. This text also explores properties of sulfur containing nuphar alkaloids; new aspects of the chemistry of biotin and of some analogs; and the glucosinolates.